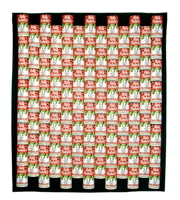 John Lefelhocz is a conceptual artist primarily known for his quilts. 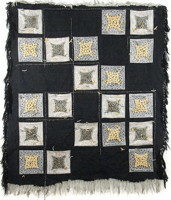 While these works have included a host of found objects, including kitchen matches, sugar packets, glass beads, aluminum roof flashing, toy watches, pennies, marbles, orange weed whacker line, fluorescent lights, nylon window screening, dental floss, and plastic flies, they possess the basic structural characteristics of traditional quilts. They are made of predominantly fabric or fabric-like material and have at least two full and distinct layers—a face layer and a backing layer. The face and backing layers are held together by elements that pierce all layers and are distributed throughout the surface of the work. Although they are nonfunctional, John's art quilts also retain a symbiotic relationship with classic quilt design and often reference traditional patterns. 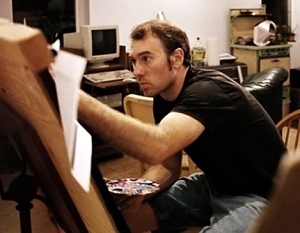 John studied mixed media at Ohio University in Athens, Ohio, where he still lives. He invented the term "juxtapassion," a combination of the words juxtapose and passion, to describe his creative method of placing things he feels very strongly about side by side. 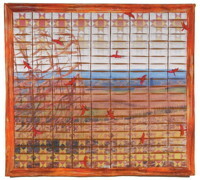 In addition to quilts, John also creates works in many other media including sculpture, painting, beadwork (he considers any pierced object a bead), cartography, and the graphic arts. An avid cyclist and mechanic, he has owned Cycle Path Bicycles in Athens since the mid 1980s, a business he operates with his wife. 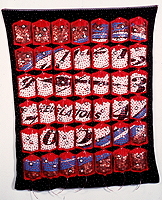 One of his beaded pieces is "The Gecko Cruiser," a late '60s cruiser bicycle covered with 106,500 Czech glass beads that are held together with 493 feet if wire, nylon thread, and epoxy putty and arranged in a seamless tessellated pattern of repeating geckos, similar to M. C. Escher's famous designs. 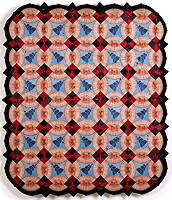 John's quilted work debuted at Quilt National 1999, when Money for Nothing was juried into that prestigious exhibition. Over the past fourteen years, his work has been shown nationally and internationally and pictured in several books, including Robert Shaw's American Quilts: The Democratic Art, 1780-2007 and Masters: Art Quilts. 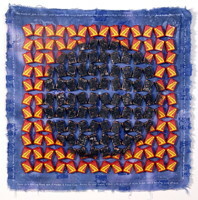 Two of his quilts are part of the renowned John M. Walsh III Collection of Contemporary Art Quilts. 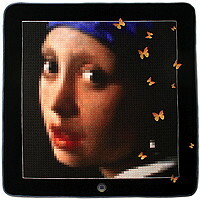 His Mona in the Era of Social Butterflies, the first in a new series of digitally printed works, won a Juror's Award of Merit at Quilt National 2013. 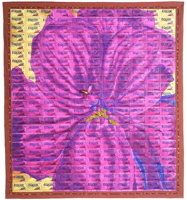 The second quilt in the series, The "Awefsome" Face Painting of North Coast Mona, is offered below.